This recipe was very easy and came out very good. But I think the proportions are wrong, I halved the recipe and still made at least 2 dozen. 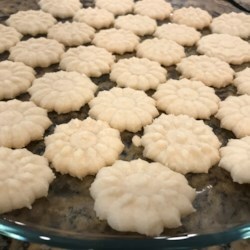 I also didn't have a cookie press, so I just rolled the dough into little balls, then flattened them on the cookie sheet. Next time I plan on dipping them in melted chocolate... mmmm..